« Has the New York Times Endorsed Sarah Palin? My favorite actor, Paul Newman passed away Friday, September 26th, after suffering from cancer. I loved Paul Newman’s acting, his roles and the movies he chose. Being a fan of sports and formula car racing (sorry, not NASCAR) meant that Newman also had another hold on my attention. His devotion to serving others through his charities and business interests set him apart from the majority of celebrities. But even these passions paled when compared to what he felt for Joanne Woodward, his wife of 50 years and also a movie star. Their long marriage, raising a family in the hills of Connecticut, was a true Hollywood anomaly. He was 83 years old; A pretty good ride. Retiring in 2007, his last role was playing the voice of “Doc Hudson”, world’s greatest race car, in the animated movie “Cars” and it was a fitting epitaph. Though known as a great actor Newman was also a hell of a driver and racing team manager. In 1978, at Summit Point Raceway, I saw Paul Newman drive for the first time. I wasn’t a fan of his movies then and most of my crowd were quite cynical about a rich movie star horning in on our local SCCA club racing. He had the pole that day (of course, he had lots of money so his car and crew were the best). 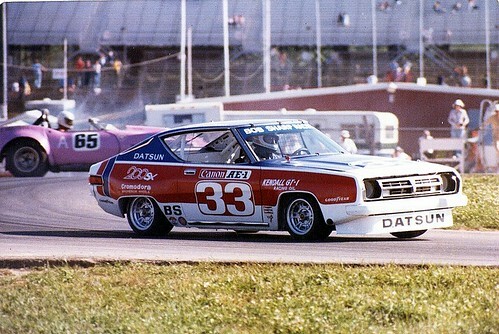 I remember he was driving #33, a Datsun 200SX ( a ‘sporty’ B210) in the red white and blue livery that Bob Sharp racing would later become famous for. It was drizzly and on the first lap he spun out, much to our delight. You can’t buy talent, we thought. There were about 20 cars in the field that day and Newman passed a car on each lap, usually in the Carousel , a very tight series of downhill ess turns. He went on to win the race by a nice margin. We were impressed. Later on, in the Paddock I saw Newman walking along pit row, right towards me. As we approached I neversously said, “Nice race”. “Thanks, kid.” he replied, raising his can of Budweiser in salute. A great American icon. I’ll miss him. This entry was posted on September 27, 2008, 6:10 pm and is filed under Biography, Culture. You can follow any responses to this entry through RSS 2.0. You can leave a response, or trackback from your own site. Besides, when Chris and I are in the same room, you would truly know who the would be the imp. Chris and I are former co-workers. P. S. I apologize to any Paul Newman family, friends, or fans who are grieving. Really. I was just joking a little. I do like Paul and Tom S. movies a lot. He was a lot more than the world knew. He didn’t like to toot his own horn and all the money from Newman’s Own did go to charity. If I raised a bunch of bucks for charity I’d want to know where every penny went too. Bet a lot of people who give to the United way don’t know they are supporting planned parenthood. Call me an imp all you want–but doesn’t drawing attention by Newman’s Own, and other visible charitable giving point to loud horn-tooting? Perhaps the ones making comments on Newman’s “irrational liberal politics” could outline them in detail? Sweeping vague comments and accusations using adjectives and general terms are rather cowardly unless they outline specifics so that one can argue the points. Oh, and define “liberal”, thank you. It sounds to me as though it has become a buzzword that means different things to different people. Outline what it is in a manner that does not confuse cognition with evaluation. If you are capable, that is. Newman’s actions seem to be consistent with that of a humanitarian. Anyone that hung out with Martin Luther King Jr.can’t be all bad in my book.